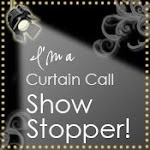 My dear friend, Pam Varnell is Featured Stamper #51 this week on SCS! 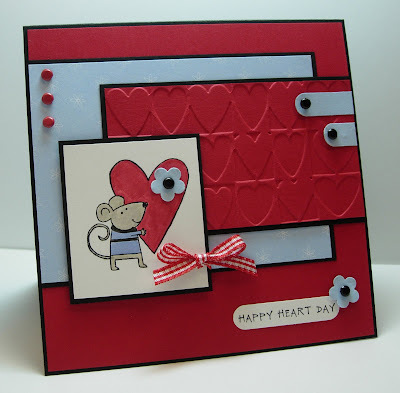 HERE is Pam's SCS gallery (StampingPam), and HERE is Pam's blog, The Stamping Addict. Pam is so incredibly talented, you've GOT to see her work! She has knack with unusual, bright color combinations that always leaves me thinking, "wow, I would have never thought of putting those colors together, but she made is work so beautifully!". Not only do I find Pam's work inspiring, she is a super sweet person and wonderful friend. THIS is Pam's card I chose to case for the challenge, and of course, I HAD to create a card in true Pam fashion .... bright, unusual color combinations! I used the colors from the new Stampin' Up! East Coast Prep dp .... More Mustard, Real Red, Tempting Turquoise, and Wild Wasabi. Things I changed from Pam's card: a) different papers and colors, b) paper pierced the bottom border instead of dry embossing with the Crop-A-Dile, c) reversed the sketch, d) the elephant's arm and ear are paper pieced a second time for depth, and e) omitted the butterfly image (what a PAIN to cut out! ... I tried!) and used the "Sending You My Love" image from Circle of Friendship. The More Mustard piece behind this image was paper pierced using the Priceless Classy Brass Template. THANK YOU for your patience during my absence. I have been feeling much better the last couple of days, and even stamped yesterday (it felt so-o-o good!). I created this card using Paper Pretties' new Cuddle Me Sophia Clear Art Stamp and Beate's Weekend Sketch Challenge #31 (last week's challenge). Last night, Paper Pretties launched three more new stamp sets! I've received several e-mails today from blogging friends to see if I'm OK since I haven't posted since Monday. Well, I've been under the weather all week, and just haven't felt up to stamping (gasp!). I am really hoping to be back to my old self sooner rather than later. Thank you to everyone who has checked in on me via e-mail and through my blog! Hoping to be back very soon! I've received several wonderful RAK's (Random Acts of Kindness) this week that I can share with you today. This first beautiful card is from my friend and fellow Paper Pretties Guest Designer Dawn Easton, Treasure Oiler Designz. Dawn used the new Stampin' Up! 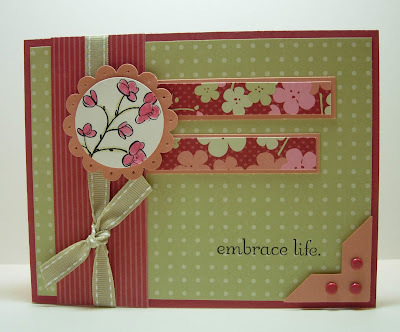 stamp set, Embrace Life, and the new designer paper, Ginger Blossom ... two of my favorites from the new catalog! Speaking of Paper Pretties, Christie is moving more and more inventory into the sale category in the boutique every day; an "out with the old and in with the new sale"! New products will be added daily! Click HERE to go shopping at Paper Pretties. This next card is from Cindy Motherway, aka Mothermark on SCS. This is the Featured Stamper Tribute card Cindy created for the Featured Stamper Challenge #48, and it is a HUGE card ... 5 1/2" x 8 1/2" to be exact! Wish my photograph could do this gorgeous card justice ... it is stunning in real life ... lots of layering and sparkle! Cindy played on Beth's introduction for the challenge, made it a gorgeous card, AND mailed it to me! What a wonderful keepsake to remember the honor of being a SCS Featured Stamper! Click HERE for all the details on Cindy's card. 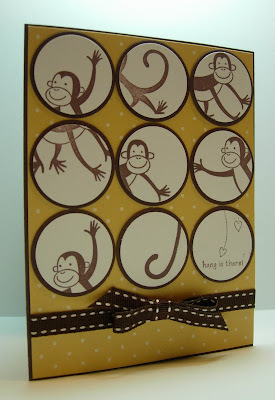 This adorable monkey card is from my friend, Sandy Braddock, aka doublesmom on SCS. I just love the variety of circle punched monkey images! Very creative! 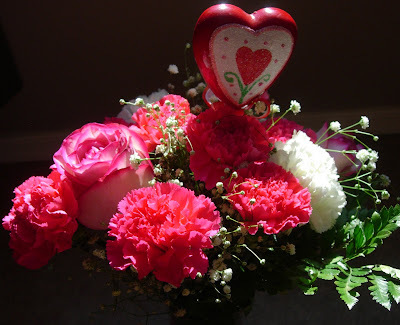 This morning, my friend and neighbor, Tammy Mendoza brought flowers to me to brighten my day! Tammy is always so thoughtful and full of surprises! Hope to be back very soon! * Chat Wszelaki's A CHALLENGE JUST FOR YOU #001 on her blog, Me, My Stamps, And I. Chat is also known as nitestamper on SCS. 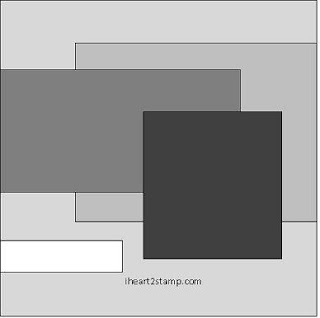 Stamp: Use the Mouse from the Happy Heart Day Set. Embellishments: Black, Red Embellishments only. Please try not to substitute above. That is the whole objective of the challenge. As you can see, I flipped the sketch. I learned long ago in scrapbooking that faces and heads in photographs should be pointed toward the center of the page, and I think that same rule applies to cardmaking. I think the mouse looks so much better facing the center of the card, versus the outside of the card (much more inviting!)... my only reason for flipping the sketch. So now you've learned something quirky about me today! It's difficult to tell in the photograph, but the large background piece is the Bashful Blue Designer Paper with small white flowers from Cutie Pie. The Real Red CS piece was dry embossed with the Heart Blocks Cuttlebug Embossing Folder (non-SU). Notes: Card front measures 5 1/4" x 5 1/4". If you've been playing along with the Paper Pretties Search for Snowflake, I hope you were able to attend the party last night to hear the big announcement ... Paper Pretties has released their own line of clear art stamps! Here is just one of the images in the current release from the stamp set, Snowflake Kisses. To view or purchase the entire stamp set, click HERE. For more samples using the NEW Paper Pretties stamps from the Pretties Girls: Joanne, Charmaine, Jana, Jillian, and Julie ... and from my fellow Pretties Guest Designers: Dawn, Carole, and Danielle. (just click on each name to be taken to each individual blog). Notes: The Bashful Blue circles under the Pretty In Pink Brads are stickers from the Winter Bright SSK. Card measures 5 1/4" x 5 1/4". I can't believe I finally got my act together to do a little stamping this week! Allie and Drew were off with friends tonight, and John was engrossed in his hobby, computer generated art. A perfect opportunity for a challenge, and of course, I had to do Beate's Weekend Sketch Challenge #30! I've had the new stamp set Embrace Life for weeks, and I finally got around to using it tonight, along with the new Ginger Blossom DP. Tools: Aquapainter, Scallop Circle Punch, 1 3/8" Circle Punch, Photo Corner Punch, Paper Piercing Tool/Mat/Template, Stamp-a-ma-jig for sentiment. LAST PAPER PRETTIES CLUE IN SEARCH FOR SNOWFLAKE AND YOU'RE INVITED TO A PRETTIE PARTY! The Search for Snowflake is coming to an end....hurry and submit your clues! Today's final clue is posted by Christie. All the other Prettie Girls, Julie, Jana, Joanne, Jillian and Charmaine, have posted clues this week. Be sure to collect ALL the clues to register for the grand prize! Unscramble each of the clues, and rearrange them to provide a complete sentence. Your final answer is due by 5pm CST to paperprettiesprizes@yahoo.com. Stop by Paper Pretties at 7pm CST tonight to see what it is that we've been searching for all week, and to see if you've won the grand prize!! Join the new forums for a party following the grand prize draw!! Who: Everybody who loves to stamp! Why: To celebrate the big announcement!!!! There will be games, prizes, the customer submission contest will be announced, and LOTS of fun!! You'll need to register as a user to the site, so please stop by a little early to make your way into the Forum. All you need to do is click on “register” below the member’s login. If you’ve already registered, then just log in and head to the Forum! Once in the Forum, look for “Parties”. Hope to see you there! Don't forget about the sale that is happening at Paper Pretties until Midnight central time tonight! Just enter this code nwss25 to get 25% off all regular priced items! Today’s Paper Pretties clues in search for snowflake are posted by Charmaine and Jana. Don't miss your chance at today's daily prize! Julie Masse, Joanne and Jillian have all also posted clues this week. Be sure to collect all the clues to register for the grand prize! Yesterday was one exciting mail day! I received TWO gorgeous RAK's! 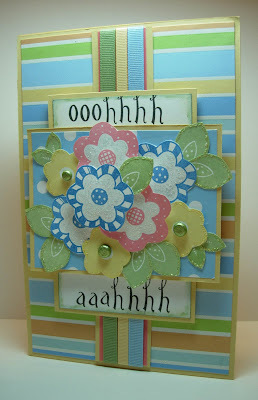 The first card I'm showing you is from my dear friend and SU Sideline, Lorri Heiling ... Confessions of a Stamping Addict. 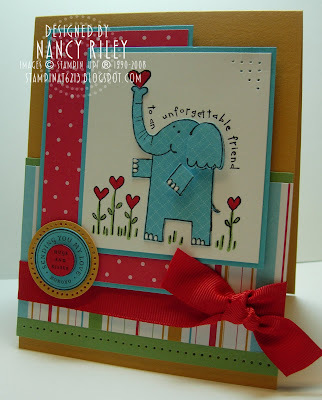 This is the card Lorri created on Sunday for the Featured Stamper Challenge (FS48) on SCS, caseing this card of mine. I was so surprised when I saw this gorgeous card posted on SCS because I've been trying to get Lorri to play along with the SCS challenges FOREVER! I was even more surprised when I received the actual card in the mail yesterday! Lorri is just one of the most thoughtful people I've ever had the privilege of knowing ... she wrote the nicest things inside the card, along with a friendship poem. For all the details on Lorri's card, visit it on SCS or Lorri's blog. This next adorable card is from my friend, Karen Laub, nikesmom on SCS. Karen and I are band booster moms together, she attends my classes, and has a true passion for the art of stamping! I had given Karen the Merry & Bright stamp set from the Holiday Mini Catalog, along with the Real Red 5/8" Grosgrain Ribbon for her birthday/Christmas gift, and she (in her "creative Karen way") used both of them in a thank you card to me! How cool is that?! Karen's card is so cute! ... love that snowman image with the Dashing DP! I'm so impressed that she mailed thank you cards out (unlike my lame self!). Remember the card I promised last night? It was one of those that I talked about in this post that ended up in the trash! Stampin' mojo, please come back !!!! 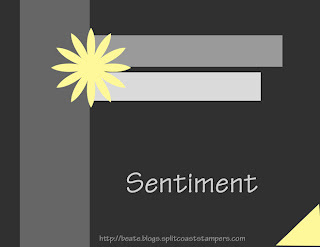 In the meantime, I'll fill up some space on my blog with a fun tag that I received from Dawn Easton at Treasure Oiler Designz! 1. Name your 2 favorite Scrapbooking topics. I think it used to be Allie and Drew! I honestly wouldn't know because it's been FOREVER since I've scrapbooked. BUT I do need to tackle Allie's high school album very soon in preparation for her senior year next year! 2. What are the two best places you've been to? I'm a neat freak, and I love to stamp! 7. What are your two favourite occasions to make cards for? 8. What are your two favourite SU! Cardstock colours? My Question: 9. 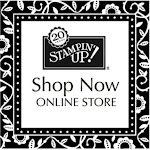 Name two of your all-time favorite Stampin' Up! stamp sets. Obviously, all of these questions have "2" in them, so you'll need to answer these questions on your blog & add one more question with "2" of something (this tagging started with 4 questions). That way it spreads & it'll get longer & change depending on who it visits! Tag, you're it! 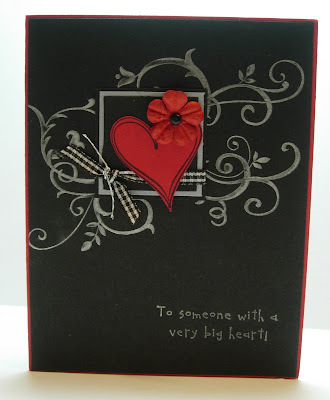 Jackie Pedro, The Scalloped Edge and Lorri Heiling, Confessions of a Stamping Addict. Today's Paper Pretties' clue in the search for snowflake, day #3, can be found on Julie Masse's blog, Stampin' With Julie. I'm working on a card that I'd like to post this evening, if possible, but didn't want the day to get away from me without letting you know about the Paper Pretties Snowflake Clue, Day #2 on Jillian's blog, Ink, Stamp & Scrap. Have you checked out the big sale yet? Paper Pretties is celebrating it's new website and you're all invited ... 25% off all regular priced merchandise! (enter code nwss25 at checkout). Sale ends January 10, so hurry! No new stamping samples to share today .. I've been busy typing! Yep, I always told myself that if I was ever Featured Stamper on SCS, I would acknowledge every single participant ... and by golly, I think I have! ... 200 of them as of this writing! Edit to Add: Correction ... 155 as of this morning .. not 200 .. must have had my eyes crossed last night ... could have sworn there were 200! 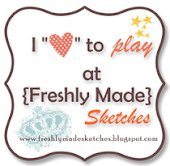 What a thrill it's been to see other stampers be inspired by your work! I've been having the time of my life! Thanks to EVERYONE who played along ... it means so much! Join the Prettie Girls each day this week on the Search for Snowflake. Clues will be given daily until he is found with daily prizes and a grand prize at the end of the week! Find your first clue and all the details on Joanne's blog, Just a Little Something. BIG NEWS !!!!!! and BIG SALE !!!!!! I have been asked by Christie Ortman to serve as Guest Designer for Paper Pretties for the next three months!!! 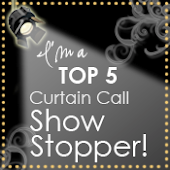 I'm keeping really good company too ... joining me as Guest Designers are Dawn Easton, Danielle Lounds, and Carole Burrage. 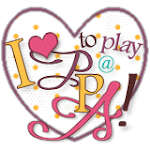 Paper Pretties has big surprises coming very very soon, and I am so excited to be a part of all of it! Keep checking back for details! In the meantime, Paper Pretties is having a HUGE sale, and ALL regularly priced merchandise in the Paper Pretties Boutique is on sale for 25% off through January 10th! Use coupon code nwss25 to receive 25% off all regular priced merchandise. New merchandise will be added to the store daily! The Paper Pretties website has had a fabulous new makeover, as well. Edit to Add: It is NOT my birthday ... just feels like it's better than! OMG OMG OMG !!!!! I'M FEATURED STAMPER THIS WEEK ON SCS! I'm jumping up and down right now and my family is over my shoulder looking at the computer screen to see why ... 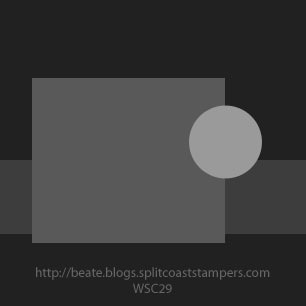 I'm the Featured Stamper #48 on Splitcoast this week !!!!! Having your artwork cased is one of the biggest forms of flattery in the stamping community... so make my day and head on over to my SCS Gallery (stampinat6213) to case one of my cards! Click HERE for Featured Stamper Challenge #48 details. I've only been designing cards since June (and stamping for almost 6 years). I know when I see other stampers/bloggers post their creations, it "looks" as though they just "whipped" their designs up! KWIM? I suppose there are probably alot of stamping designers out there that work quickly, but let me tell you, I'm not one of them! Most of the cards I design are a result of hours of thought, experimenting, and tweaking (as much as I'd like to participate in every challenge I come across, this is why I can't!). Even after all of that, I'm never 100% confident in showing them to the masses on my blog and SCS. There's a certain reputation that a stamper/blogger is trying to establish. (I look at it as building a portfolio.) Each time I post a design I wonder if it's good enough to show, wonder if it looks too much like the cards I've seen on SCS and other blogs ... you know, all those self doubt questions come up! There are some cards I've created that you will never see too ... they all end up in the trash! If you've ever considered sharing your artwork on a blog or SCS but were hesitant, I just want to let you know that even some of us who have shared for quite some time can be unsure too! ... BUT, it's worth the risk when you receive unexpected comments about your work that get you pumped up to create again and again! The elephant was stamped twice in Jet Black Staz-On on Pretty In Pink CS. The entire body was cut out once, then the ear and arm cut out of the second image. The ear and arm are adhered with Stampin' Dimensionals. There are three additional flowers to the left of the main image. In order to stamp these three additional flowers, I covered the first stamped image with post-it notes (masking) and used the Stamp-A-Ma-Jig to line them up. The Certainly Celery piece in the upper right hand corner is from the Photo Corner Punch. A White Gel Pen was used to paint the elephants "toes" and "fingers". In case you can't tell in the photo, the card base is Whisper White CS. I received this hand stamped Christmas card from my Stampin' Up! "niece", Ginny Schembri, along with a photo of her beautiful family. Thank you, Ginny !!! The winner of the New Year's iCANDY in THIS POST has been chosen! I got such a kick out of reading your comments and guesses as to how many times I wrapped the book of Lifesavers! Many of you underestimated my love of PAPER! (Gift wrapping is a close second to stamping!) Then there are some of you that think I'm Wonder Woman --- I can't imagine wrapping the book over 100 times! Just to clarify, I do not wrap the book in one sitting ... it is progressive, and I'll wrap a few layers every day leading up to Christmas. Onto our winner .............only ONE person guessed the correct number ...... I wrapped the book of Lifesavers 57 times! Jenmarie had the correct guess of 57 !!!!! Jenmarie said ... What a GREAT tradition!! !Hmmm...I'll guess 57 times! Please contact me with your mailing address via e-mail, Jenmarie! Congratulations, and thank you to everyone who commented! This criss cross card uses the NEW Stampin' Up! Bali Breeze Designer Series Paper and Eastern Elegance Rub-Ons. 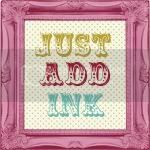 Yep, Stampin' Up! has FIVE different Rub-On packages available in the NEW '08 Spring-Summer Catalog & Idea Book (pg. 182, U.S.)! The medallion for my card was inspired by Mary Jo Albright's card seen HERE. MJ also shows how to achieve the look of the Pumpkin Pie layer of the medallion using the Scallop Punch. 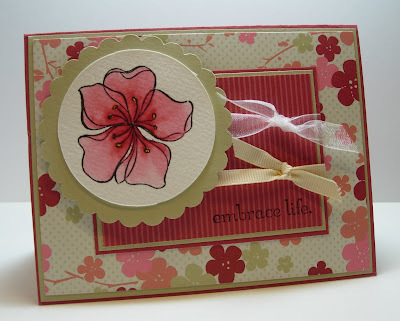 The flower image of my medallion, and the wording on the card insert were achieved with the NEW Stampin' Up! Rub-Ons. (MJ stamped her flower image from the stamp set, A Beautiful Thing, in Versamark and embossed with White Embossing Powder). I have to admit, I was a bit skeptical at first about these Rub-Ons, but after using them for the first time last night, I'm sold! The are so easy to use! Simply cut out the Rub-On image you want to use and remove it from the backing sheet. 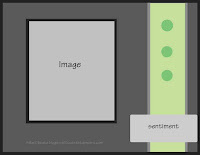 Lay the image on a flat surface, and firmly rub the image with the stick that comes in the package to transfer it to your project. They can be used on paper and most non-porous surfaces, including glass, photos, clipboards, candles, and more. The Rub-On images are designed to coordinate with many Stampin' Up! stamp sets. Notice how the flower Rub-On for the medallion is the same flower image found in the stamp set, A Beautiful Thing. Each Rub-On package contains two sheets, 1 ea. black and white. Stamps: None. Images were achieved with Eastern Elegance Rub-Ons. 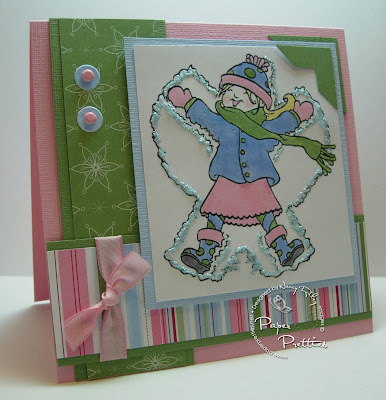 Note: Click HERE for Criss Cross Card Tutorial by Beate Johns. Don't forget to leave a comment for a chance to win iCANDY in the previous post ... the winner will be selected the evening of January 3! HAPPY NEW YEAR iCANDY !!!!!! HAPPY NEW YEAR !!!! I'm kicking off the new year with some blog candy (which I fondly call iCANDY on iSTAMP!) Over the past couple of weeks, I've been watching my counter in the 90,000's, and was really crossing my fingers that it would hit the big 100,000 on New Year's Day ... oh well, it's close enough for me! I haven't talked much yet about our Christmas, and won't go into a whole lot of detail. My brother and his family (the four on the right of the photo) came to Phoenix from Iowa for five days. Their last visit was seven years ago, so this trip was much anticipated! We had a WONDERFUL Christmas with lots and lots of food, games, food, visiting, and more food! This is my favorite photo from their trip, taken after church service on Christmas Eve (which was my favorite part of the celebration ... the church service was beautiful and inspiring!). We also spent a day driving to Tucson to visit the Arizona-Sonora Desert Museum, a world-renowned zoo, natural history museum and botanical garden, all in one place. It was so-o-o cool! Onto the iCANDY ..... Have you seen all the new Designer Papers in the NEW Spring-Summer '08 Catalog & Idea Book? You know I've got a weakness for Designer Paper, and I need to make room for new. I'm giving away this assortment of 27 full 12 x 12 sheets of Stampin' Up! retired Designer Series Papers from Petal Patch, Spring Showers, Spring Flowers, Au Chocolate, Loves Me, and Notations. How do you win this iCANDY? See the book of Gummy Lifesavers in the photo below? Five years ago, I started a Christmas Eve tradition with my kids and my foster sister's kids. The first Christmas gift I buy every year is a book of Lifesavers, and start wrapping it over and over and over again until I either run out of wrapping paper or get so sick and tired of wrapping it that I can't possible wrap another layer! The wrapped package in the bottom of the photo is the finished product from this year. On Christmas Eve, the kids gather in a circle and take turns unwrapping one layer at a time, and counting the layers as they go. The person that unwraps the very last layer wins the book of Lifesavers. It is fun to see how many times I wrap it every year, as I don't keep track while I'm doing it, and also fun to see which kiddo wins it each year. To win the iCANDY Stampin' Up! Designer Paper assortment, leave a comment with your guess as to how many times you think I wrapped the book of Lifesavers this year. The person with the correct or closest guess wins the dp assortment. In the event of a tie or ties, I will use random.org to choose a winner. A winner will be chosen the evening of Thursday, January 3. HAPPY HAPPY NEW YEAR to each and every one of you that stops in to read my blog! Good luck !!! Edit to Add: Due to cost of shipping, U.S. and Canadian shipping addresses only.